Join the fun at the Tillamook County Fair, in Tillamook Oregon August 10-13, 2011! Last year, the Tillamook County Fair was chosen by USA Today as one of the top ten Blue Ribbon Fairs in the nation. For the past 86 years, Tillamook County Fair has hosted the world famous Pig-N-Ford races. If you have not seen these races, it's worth the trip and price of admission just to experience these races! 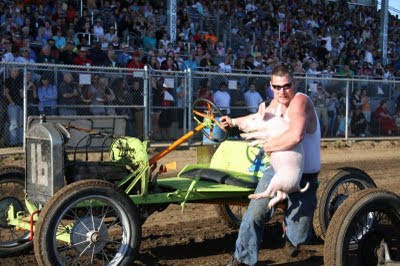 PIG-N-FORD RACES have been featured on Good Morning America, KATU's "Spirit of the Northwest", National Geographic, the Internet and Comedy Central. Bring the whole family and experience an old fashioned county fair that adults and children alike will remember for years. Get Ready For the Tillamook County Rodeo!